If you’re not already using it, let me quickly introduce you to Preview. Preview is an app to plan your Instagram feed. You can design your feed, edit your photos, repost, schedule, see your analytics… and… there are a LOT of Instagram hashtags tools too. As you can tell there’s a lot going on in one app. But the beauty of it is: it’s very easy to use. Today I want to show you one of the hashtag tools of Preview app: The Hashtag Finder to find Instagram hashtags. The Hashtag Finder is an Instagram hashtag search tool. It allows you to search for Instagram hashtags by category, country and even Instagram communities. 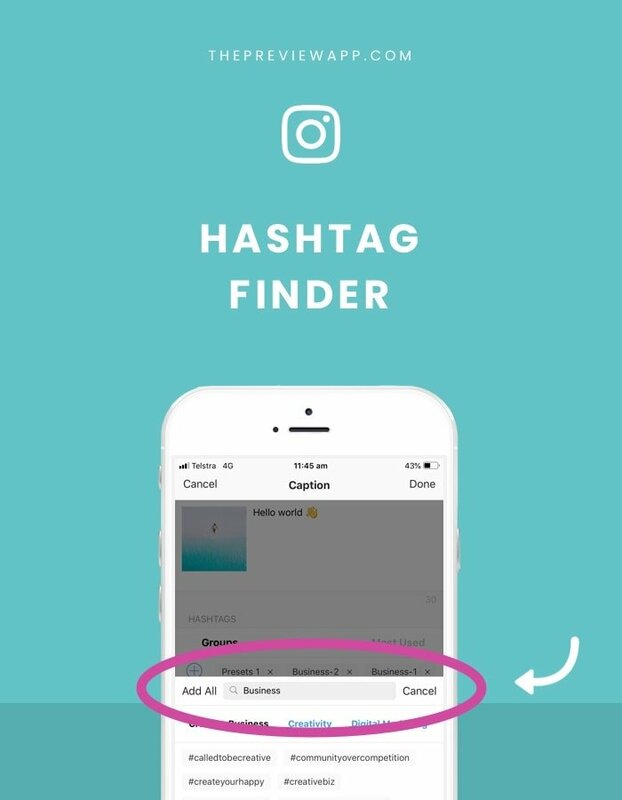 In each category, the Hashtag Finder gives you a mix of trending hashtags, hashtags to get you featured on big accounts, and hashtags to join awesome Instagram communities. There are around 90 hashtag categories and 2,000 trending Instagram hashtags in the Hashtag Finder. So if you ever feel stuck trying to find the RIGHT hashtag for your account, look in the Hashtag Finder. Alright, but where is it and how to use it? The first step is to open your Preview app. Preview is a Instagram feed planner app. So you have to upload at least one photo to get started. To add a photo, just press on the “+” button on the top right corner of the screen. The Hashtag Finder is built in the caption section (so that you can directly add any hashtags you want in your caption). 1. Add All hashtags: If you like all the hashtags that are in one category, press “Add All”. All the hashtags from that category will be added in your caption. 2. Add some hashtags only: If you want to only select some hashtags from that category, just press on it. Then go can continue to search for other hashtags in other categories. This way, you can make your own Instagram hashtag group. Tutorial: See how you can save your hashtag group in Preview to avoid typing (or copying and pasting) all the hashtags over and over again. If you already use Preview, you know the drill. If you’re new… Congratulations! You’ve just created your first post in Preview AND you also used the Hashtag Finder.